Listed below are Srinagar Taxi rates 2019 that will be applicable for renting a taxi in Srinagar for either local sightseeing in the city; or for visiting other places in Kashmir like Gulmarg, Sonamarg, and Pahalgam; or for traveling towards Ladakh or Zanskar Valley. The rates listed in the image below are for renting an SUV but smaller cars are available as well. The rates below are not for A.C. vehicle. If you need the A.C. in the car turned on then it will cost you an additional 19% of the total rent of the cab. The most important thing to remember while renting a taxi in Kashmir is that there is no enforced rate list as such. True that there is a union rate list which is mentioned in the image below but it does not always apply. The final amount you will pay will heavily depend on your own negotiation skills, type and condition of the cab you were renting and who were you dealing with. If you went via a travel agency or a hotel, then they will charge you slightly more than this. If you spoke directly to a driver, he may settle for a lesser amount to win a customer over. It may also depend on how long you were renting the cab for. On an average basis though, a smaller taxi in Srinagar costs about Rs. 1800 per day and an SUV will cost about Rs. 2200. If you rented it for 2 days, then add another 50% of the daily cost for an additional day. If you wanted to rent a cab in Srinagar and needed a reference, then you may talk to Faisal at 9596410670. Give my reference and he will quote you the best possible price. The rates are applicable for a pick and drop at Tourist Reception Center, also known as TRC, in Srinagar. It is located on Srinagar Leh highway near Dal Lake. If you wanted the driver to pick you from a different location; like your hotel or airport than they may charge you a little extra for that. It all depends on your negotiation though. If you were talking directly to the driver, then he will provide you the same rates from the airport as well. The rates mentioned above are for a single day journey, in cases of both drop and return. If you were, however, renting the taxi for 2 days, then add another 50% of the daily cost. Like, for example, if you booked a cab for Gulmarg then it will cost you Rs. 2,050 for a return journey. However, if you wanted to make the trip in 2 days then add another Rs. 1100 to it and you will pay a total of about Rs. 3,100 or 3,200. The rates above are all for private taxis but shared cabs too are available on some of these routes which will cost you way less. I have provided information on shared cabs further in the article. A private taxi to drop you at the airport in Srinagar will cost you Rs. 700. For pick up from the airport and drop at your hotel will cost you Rs. 1,026. In real world though, the charges are less. I have had a driver pick me from the airport and drop at my hotel at Srinagar for Rs. 500. But if you rent a cab from the airport taxi stand then the charges mentioned above will apply. If you had already booked a driver and he was going to pick you from the airport then it will cost you less. A private taxi from Srinagar to Doodhpathri (or Dudhpathri) will cost you Rs. 2500 for a return journey. For more information, please read How to Plan a Trip to Doodhpathri. A prepaid taxi from Srinagar to Gulmarg will cost you about Rs. 1850 for a drop. For a return journey, taxi fare from Srinagar to Gulmarg and back would come out to be Rs. 2,050. Private taxi operators may charge you more for cabs like Innova but for a Sumo or Bolero, this is what you will pay. If you rented the taxi for two days then it will cost you anywhere between Rs. 3000 to Rs. 3500. An important thing to remember here is that these rates are applicable only during summer. In winter, the road from Tangmarg to Gulmarg gets blocked and can only be traveled upon with help of snow chains. So if you were visiting in the months from January to March, then the rates will be way high. You will first pay about Rs. 1500 to Rs. 2000 for a cab from Srinagar to Tangmarg. Then you would have to rent another taxi in Tangmarg for reaching Gulmarg. This will cost you an additional Rs. 1000 for a drop at Gulmarg; and Rs. 1600 for the same day return to Tangmarg. If you booked a tempo traveller for Gulmarg, it will cost you about Rs. 3000 for a same day return trip and Rs. 5000 for a 2 days trip. Shared taxis are available for Gulmarg from Srinagar but you will have to break your journey in parts. Finding a shared cab from Srinagar all the way to Gulmarg will be very tough. By a shared cab, you will first have to travel from Srinagar to Tangmarg for Rs. 100 and then Rs. 50 for Tangmarg to Gulmarg. Another choice would be to board the Bus which will cost even less. If you want to read more about how you can travel to Gulmarg by shared cabs and Bus, I recommend that you please read How to Plan a Trip to Gulmarg. If you were visiting in winter, then please take a look at How to Plan a Trip to Gulmarg in winter. A taxi from Srinagar to Pahalgam will cost you about Rs. 2500 for a drop and Rs. 3000 for a return journey on the same day. For a 2 days trip, it will cost you about Rs. 4500 for a return journey. If you booked a tempo traveler for Pahalgam, charges will be Rs. 5500 to Rs. 6000 approximately. An important thing to remember with Pahalgam is that your Srinagar taxi cannot be used for sightseeing here. It can only bring you to Pahalgam but for visiting other areas like Aru Valley and Betab Valley, you will have to rent another local taxi in Pahalgam. Shared cabs as well as buses are available on the route and will cost you about Rs. 250 for reaching Pahalgam from Srinagar. A taxi from Srinagar to Sonamarg will cost you Rs. 2400 for a drop and Rs. 2900 for a return journey on the same day. If you hired the taxi for 2 days, charges will be about Rs. 4500. If you hired a tempo traveler, it will cost you Rs. 3200 for a same day return journey. 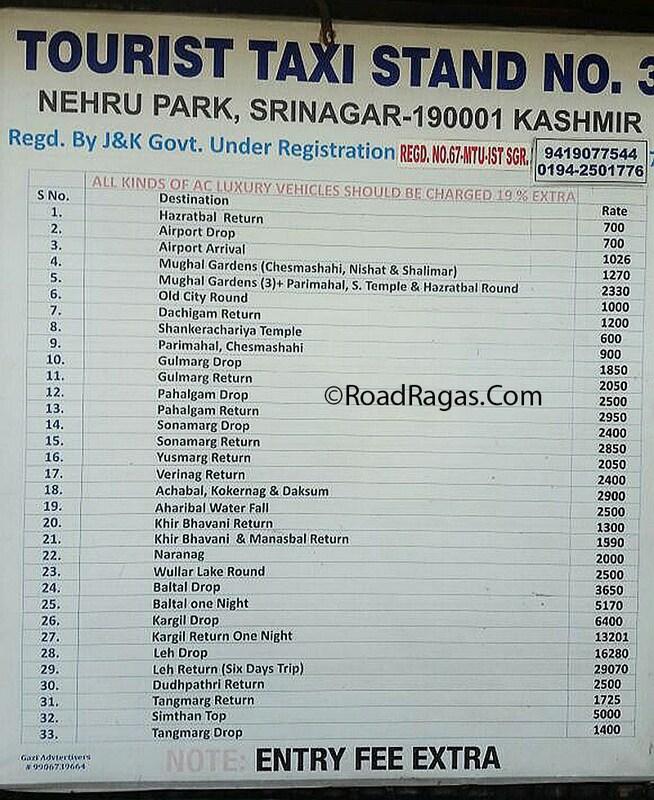 The same rates will also be applicated for a taxi from Srinagar airport to Sonamarg. Shared taxis too are available on the route and you can actually get a shared cab for all the way to Sonamarg. By public transport, it will cost you about Rs. 100 – 150 to get to Sonamarg. A private taxi for a return journey from Srinagar to Yusmarg will cost you Rs. 2,050 for same day return. For a 2 days trip, it will cost you Rs. 3100 approximately. If you hired a tempo traveler, then the charges would be about Rs. 5000 for 2 days trip. For more details on getting to Yusmarg, please read How to Plan a Trip to Yusmarg. A private taxi from Srinagar to Baltal for one day journey will cost you Rs. 3,650. If you however booked the same cab for your return journey as well to Srinagar the next day then the taxi will cost you Rs. 5,170. For a three days trip with a stay at Baltal or Sonamarg or any other place on the way, it will cost you Rs. 6,590. A private taxi from Srinagar to Tangmarg will cost you Rs. 1500 for a drop and Rs. 2500 for same day return. A one day journey from Srinagar to Leh in a private taxi will cost you about Rs. 15,000. The cab will travel non-stop for about 18 to 20 hours and will drop you at Leh. If you break this journey in 2 days then the charge will increase to Rs. 17,000. Any more than 2 days and up to 6 days, this journey will cost you approximately Rs. 30,000. For journeys of more than 2 days, your accommodation at places in between is of course not included. You also will not be required to pay for the driver as well. For night stay, you will have to look for a hotel for yourself and driver will find his own accommodation. A shared taxi from Srinagar to Leh will cost you approximately Rs. 2,200 per person. If you are traveling alone; or on a budget and do not want to be traveling in the bus then boarding a shared taxi from Srinagar for Leh is a great choice. The only drawback is that these taxis travel non-stop for about 18-20 hours; with very limited breaks and can get uncomfortable. It is not a good option if you are traveling with family. A private taxi from Srinagar to Kargil will cost you Rs. 6,400 for a drop and Rs. 13,200 for a return journey in 2 days. If you want to stay at Kargil for a day and return to Srinagar on Day 3, then a 3 days journey will cost you Rs. 14,730. A shared taxi from Srinagar to Kargil will cost you Rs. 900 to Rs. 1000 per person. The journey will be completed in one day and the cab will reach Kargil by evening. For a drop from Srinagar to Jammu you will have to pay Rs. 4,900 for one day journey. If you however boarded a shared taxi for Jammu, it will cost you only about Rs. 700 per person. Taxi will start from Srinagar in the morning and will reach Jammu by late afternoon. If you hired a tempo traveller, it will cost you about Rs. 9000 for same day drop. A Private taxi for Jammu to Srinagar will cost Rs. 5000 for a same day drop. For a shared cab, this cost will come down to Rs. Rs. 800 – Rs. 900 per person. These taxis are available at Jammu Bus stand and complete the journey to Srinagar in one day. If you hired a tempo traveller, it will cost you about Rs. 9000 for same day drop. If you booked a cab from Srinagar for visiting both Pahalgam and Gulmarg, it will cost you about Rs. 6200 for a 3 days trip. If you hired a tempo traveller, it will cost you Rs. 7200. If you booked a private taxi for the Mughal gardens of Chesmashahi, Nishat and Shalimar, then it will cost you Rs. 1,270. If you wanted to visit Wular Lake and Mansabal, it will cost you Rs. 3000. I hope the information above on Srinagar Taxi rates was of help. If you have any questions; or need any further details; please feel free to ask in the comments section below; or at our Community Forum; and I will be glad to answer. Namaskar Mr. Ghosh, Please talk to Faisal in Srinagar at 9596410670 for booking of car and hotels.